From left to right: Attorney Edgar Snyder, Cara Runyan, Kiersten Finnigan, Jaelyn Weingartner, Maleah Pacella. Four local elementary school students were announced as winners of the Edgar Snyder & Associates "My Holiday Wish" Coloring Contest. They each won $1,000 for their school and a gift card for themselves, plus their artwork is featured on the law firm's Holiday card, and they will appear on an Edgar Snyder & Associates billboard in their community. Maleah Pacella, age 10, of Paynter Elementary (Baldwin-Whitehall School District) took home the grand prize. Runners up were Kiersten Finnigan, age 8, of Elroy Elementary School (Brentwood Borough School District); Cara Runyan, age 10, of Clarion-Limestone Elementary School (Clarion-Limestone Area School District); and Jaelyn Weingartner, age 11, of Moore Elementary School (Brentwood Borough School District). 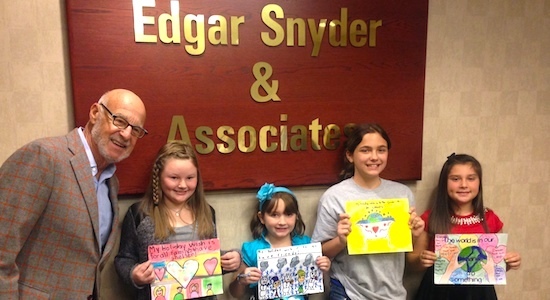 Edgar Snyder & Associates debuted the coloring contest more than 10 years ago as a way to give back to local schools, while also providing inspirational artwork for the law firm's holiday card. The 2014 contest upped the ante, offering a $1,000 donation to each of the winning students' schools. "The holiday coloring contest is a great way to give back to our local schools while also delivering an encouraging message to our staff and clients," said Attorney Edgar Snyder, who hosted a meet and greet and photo shoot with the winning students and their parents. "We were all so impressed by the unselfish holiday wishes submitted this year. If these young people are tomorrow's leaders, we have a bright future ahead." Maleah's Holiday Wish: "The World Is In Our Hands. Do Something." She may only be 10 years old, but Paynter Elementary student Maleah Pacella knows that people like her can change the world if they just "do something." 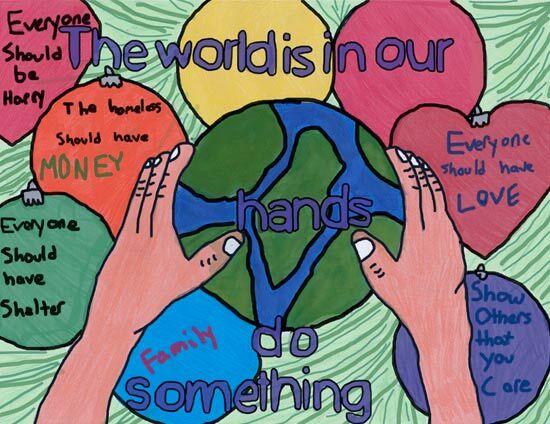 Her grand-prize-winning artwork depicts two hands holding a globe surrounded with messages like "everyone should have shelter," "everyone should have love," and "show others that you care." "Everyone can do something and everyone has a purpose," explained Maleah, describing her idea behind the illustration. "If we could all just do something we could make the world a better place." Paynter Elementary plans to use the $1,000 donation to take the students on a field trip to the Andy Warhol Museum. Kiersten's Holiday Wish: "For All To Have Friends"
When Kiersten Finnigan's art teacher announced that her artwork was selected as a winner, she responded, "Really? I can't believe it! Are you lying?" It was no lie to the judges of the contest that Kiersten's submission stood out from the more than 700 entries received. 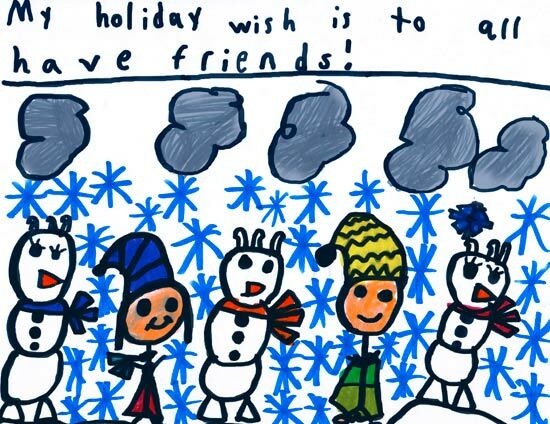 Her drawing shows a snowy scene where people and snowmen stand side-by-side under the heading: "My Holiday Wish is For All To Have Friends." Kiersten is 8 years old and enjoys soccer, computer class, and art class. She treasures the friendships in her life and hopes that more people will find companionship this holiday season. 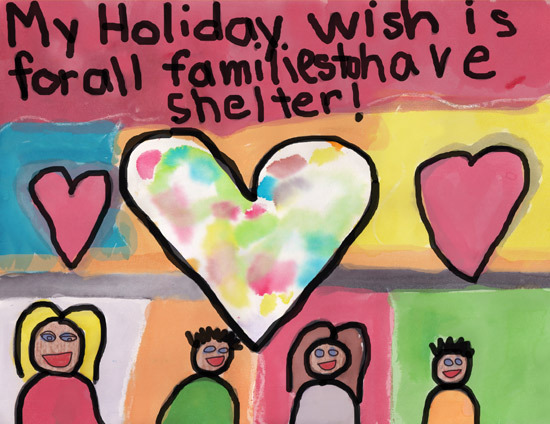 Cara's Holiday Wish: "For All Families To Have Shelter"
This holiday season, 10-year-old Cara Runyan can't wait for her family's annual gift exchange, an event that brings the many members of her large family together each year. But Cara knows that many families are not fortunate enough to have a place of their own to gather during the holidays. "Since there are people who don't have homes to live in, my holiday wish is that families would have shelter," Cara explained. Her picture used a unique and colorful mix of crayon, marker, and watercolor. "I used watercolor techniques that my art teacher taught me." In addition to art, Cara enjoys playing softball and basketball. Her favorite class is math. Jaelyn's Holiday Wish: "For The Earth To Be Cleaner"
Eleven-year-old Jaelyn Weingartner was sitting in the back of the class when her teacher made the announcement that she won. "I was surprised, and everyone started clapping for me!" she said. Jaelyn's piece is a creative reminder for all to take better care of our environment. 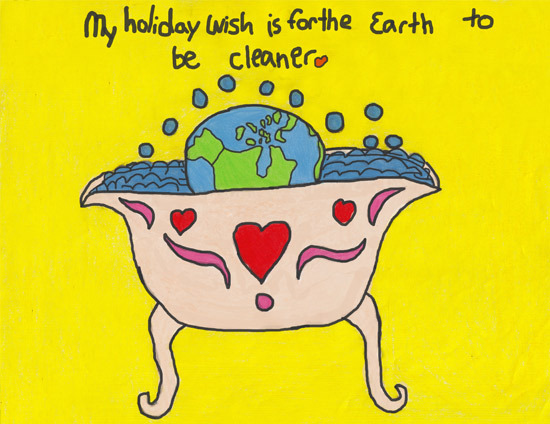 Her picture shows a globe submerged in a large bubble bath that reads: "My holiday wish is for the earth to be cleaner." Jaelyn's favorite hobbies include drawing and playing football. This year, she's excited to see her family who will be traveling in from out of town during the holidays. An independent panel of judges met on November 3rd to select the winners. Judges included: Ruth Bedeian, retired Pittsburgh Public Schools art teacher; Ing Kalchthaler, children's librarian at Shaler North Hills Library; Myrna Rosen, adjunct professor in Carnegie Mellon's School of Design and an internationally-recognized calligraphy artist; and Becky Willis, creator of the blog ‘lil Burghers. Edgar Snyder & Associates is a law firm representing injury victims and people with disabilities, with offices in Altoona, Ebensburg, Erie, Johnstown, and Pittsburgh.